Summary: Daniel Crawford has long admired the tree that stands alone on a hilltop, two farm fields away from his modest home in a sprawling neighborhood. But despite the tree’s alluring qualities, Dan never attempts to see it up close, until a devastating loss leaves him angry and frightened and grasping for peace. Finally standing beneath the giant white oak, he takes comfort in its majesty, and encounters an unlikely friend. I am so happy to welcome author Chip Rice to Booking Mama. Chip is actually a friend of mine who has recently published his debut novel THE TREE! I met Chip a few years back when our sons were on the same baseball team. Chip is a terrific guy and dad (as I'm sure you can tell after reading his guest post), and his novel sounds like a story that will definitely touch your heart. I wish him the best of luck and success with THE TREE. With discordant shouts, my boys stampede the staircase, racing to the Legos. I force a deep breath and another sip of half-caff, massage my eyelids, and calculate the days until school begins. “Dad! Play with us!” Their call is expected, inevitable, and admittedly enraging. I have meals to plan, a chapter to outline. Funny thing, though: I know the day they depart on bus 145, I’ll close the door of my quiet, empty, writer-friendly house, and try not to cry. On vapors of energy, I join them in the playroom. After over a decade of at-home fathering, I know that time with young children is priceless, not to be missed. And yet regrettably the passage of time itself is often required to impart this truth, to sink it deep. “They grow up fast,” our elders inform. “Someday you’ll miss this.” Many are the adages thrust upon parents, new to the game. I’d certainly heard them, amid the trials of round-the-clock feedings and diapers and terrible twos (especially threes!). I’d heard them, but failed to listen. They were remarks with face value, a form of well-meaning counsel, understood but never felt. Not completely. Not without time. My heart finally engaged in the fleeting nature of parenting. It happened sometime between Daddy and Dad, when Thomas and Winnie became suddenly lame and bodily noises achieved LOL status. Innocence, what remained of it, became a dripping candle I could not extinguish. And then came school, Little League, and, dare I say, interest in girls. Children do indeed grow up fast. Too fast. And I sure miss cuddles and nights in the rocker and soft little fingers wrapped tightly to mine. Perhaps the finest advice I received as a stay-at-home dad was that extremely long days equate to fast years. I’ve found this paradox undeniably true. At-home parenting—a blessing and privilege brimming with precious moments—can sometimes feel like drudgery. It is a job without end, where a day feels like two and there’s no going home because you’ve never left. Friday’s lose their appeal. Weekends, too. Sleep deprivation becomes a sport of endurance, and adult conversation (about anything!) induces an irrational, mild euphoria. As a forty-something, stay-at-home dad, I find that drudgery lives and even thrives in my ambitious, times-a-wastin’ thoughts. And yet it’s so easily sifted from hindsight. Hence long days and fast years. I need only look back to remember the miracle of birth, to set my mind on things above, perhaps even spill tears for all the endearing quirks and priceless moments tethered to seasons that come once in a lifetime. Seasons now past, gone but not forgotten. I need only look back to abandon my agenda, forsake my flawed sense of purpose, infuse my heart with another dose of eternal perspective, and rediscover youth on a carpet lined with interlocking bricks. Big brother digs into the Lego tote, determined to locate a microscopic piece. The search is deafening, almost maddening. Finally, it stops. He applies the tiny part to his intricate battle ship. And then younger brother’s eyes find mine. A boxy truck of red, orange, yellow, blue, green, and gray is held aloft for my inspection, for my approval. “Like it, Dad?” His little hand rotates, providing views from all angles. A wheel falls. He recovers it, presses it in place. “I love it,” I say, playfully squeezing his ear lobe, savoring his grin. I absolutely love this moment. 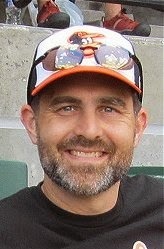 Chip Rice lives in central Pennsylvania with his wife and two sons. He is a former school counselor turned stay-at-home dad and author. His debut novel THE TREE is a suspenseful, redemptive, and ultimately heartwarming tale of one man’s quest to become the husband and father his family desperately needs. Find out more at www.chiprice.net. THE TREE is available on Kindle, Nook, Apple, and Kobo. Click here to order. Lovely guest post! Sometimes we forget to savor the wonderful moments amid all the chaos. Great guest post -- I love that bit about how the days drag but the years speed by.